The Mt. 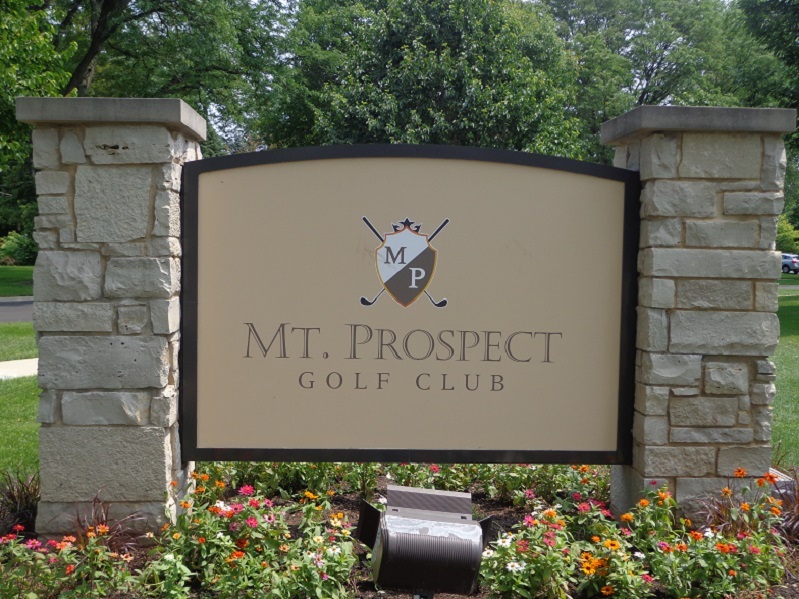 Prospect Golf Club has reopened from renovation and is ready for you to come enjoy this course designed in 1926, and now looks like a course from that era, and designed by the famous architects of that day. 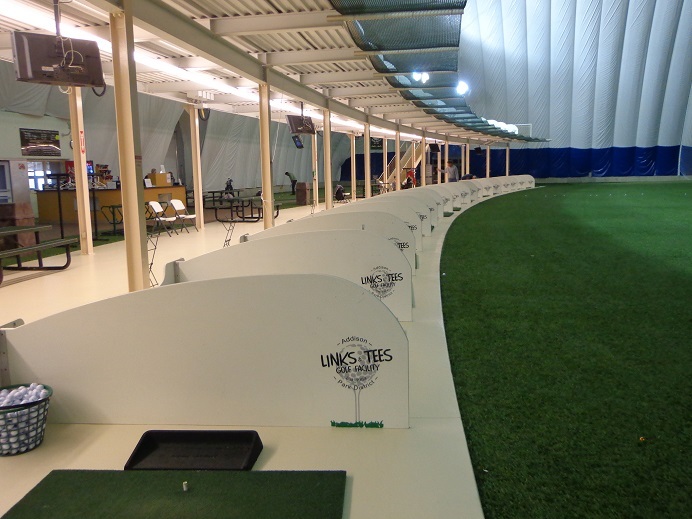 Call (847)-259-4200 and book your tee time today. The LPGA UL International Crown, Chicago’s premier golf event for 2016 will come to Rich Harvest Farms in Sugar Grove, sign up now to volunteer, reserve your corporate hospitality, or purchase some ticket options. 32 Players 8 Countries,1 Crown. The Gog Blog by Rory Spears, Editor and Director of Content. Follow Rory on Faecbook, Linkedin and Twitter @GogBlogGuy. At Old Macdonald at the Bandon Dunes resort in Oregon. The same can now be said for Mike Keiser’s, Bandon-Muni project that was about 35 minutes south of his Bandon Dunes Resort. After almost 8 years of negotiations, the project was not making enough progress and has now been called off by Keiser. So the idea of more great golf near the Oregon coast line, goes bye-bye for now and in time we will see if Keiser can put together another project in the state. This morning through the Northbrook Illinois based KemperSports management firm, Keiser released this statement. 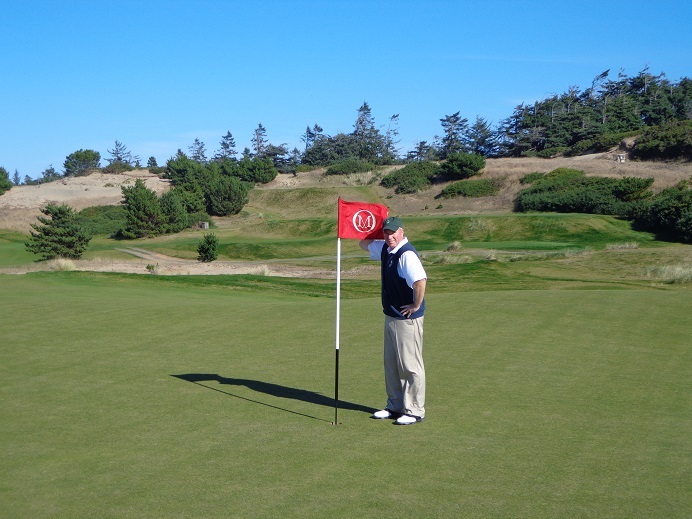 Seven years ago, I hired Gil Hanse, a world renowned golf course designer, to plan a destination golf course near Bandon, Oregon to be called Bandon Links. Coos and Curry country residents would play a world class golf course for greens fees as little as $10 dollars a round. And up to 200 high school students annually would earn money by caddying, and they would be able to apply for college scholarships in association with the Western Golf Association, whose mission is to fund scholarships for these young caddies. The project also included funding for gorse removal in the south coast area. Importantly, these programs would only be made possible by charging out-of-state tourists $200 to $250 per round. The Bureau of Land Management, the federal agency with jurisdiction over a portion of the lands that would be devoted to the project, has just advised that in keeping with federal regulations the fees charged must be commensurate with other golf courses in on BLM lands, and that revenues would have to be devoted to use on the property. That eliminates the funding source for subsidizing the low local rates, for the scholarship program, and for the off site gorse-control. Additionally, recent well testing has met with disappointing results; and that in turn creates difficulties for meeting certain Oregon land use requirements which protect lands designated as farm land. This project has great promise for boosting the local economy and providing employment opportunities and job training. And, the golf experience would have rivaled that which is present at Bandon Dunes Resort 15 miles to the north. So it is with great regret that I make this announcement. The support of Lisa Sumption, Director of the Oregon Parks and Recreation Department, and the hard work of her staff in pursuit of this project is greatly appreciated. We are also thankful for the pleasant and welcoming attitude of the local staff at the Bureau of Land Management office in Coos Bay as we were trying to work through the federal regulatory process. I am pleased to say we met some of our other goals. We contributed $450,000 to the acquisition of the Whales Cove near Depot Bay; that parcel is now owned by the Unite States Fish and Game Department for public use into perpetuity. We, long with Ecotrust, facilitated the state of Oregon’s acquisition of a highly ecologically significant 357 acre parcel known as “Sand Lake” or “Beltz Farm”, one of the last remaining undeveloped estuaries on the Oregon Coast. And in keeping with our commitment to controlling gorse, we contributed $120,000 to the state of Oregon for it’s gorse control efforts. We had hoped for additional benefits of this project which would have included our contributions of additional lands to the state park system and of money for the acquisition of other park properties. The termination of the Bandon Links project will have no effect on anything having to do with the Bandon Dunes Golf Resort where the public will continue to experience the first-class golf experience which they have come to expect there. And, my family and I continue to be devoted to the Oregon south coast area as we remain involved in projects which promote conservation, the local community and the local community by blending recreational and educational opportunities with ecological initiatives. Rich Harvest Farms owner Jerry Rich talks about the 2016 UL International Crown, don’t miss out as Women’s Golf comes to Chicago in 2016 in a big way. Rich Harvest Farms Owner Jerry Rich (L) with Gog Blog Editor and Director of Content Rory Spears (R) at Rich Harvest Farms. 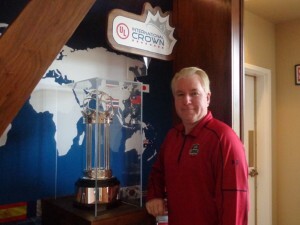 Click on above to hear Jerry Rich talk about the UL International Crown. Every once in a while the stars don’t align just right, and all sorts of crazy things happen. Yesterday seemed to be one of those type days in the world of golf. It came as a shock in the golf world that the Southern Methodist University (SMU) mens golf team got dragged into a scandal with the men’s basketball team and Hall of Fame Coach Larry Brown. But then again the NCAA isn’t always one of the brightest or fairest organizations. Their lack of thinking struck again, when they hammered SMU with a series of penalties. While it does appear some of this was justified, and not just because years ago the football team got what’s known as the death penalty in college sports. 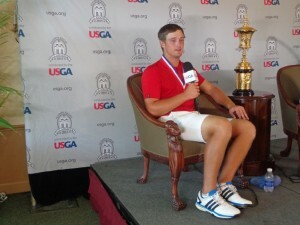 Bryson DeChambeau won the 2015 U.S. Amateur at Olympia Fields in August, last May he won the NCAA National Championship. It seems yet again, that a current team in college sports is being penalized for something that was done before they even entered that schools program. The biggest issue for SMU is that they are not allowed into post season play in 2016, which means current SMU golfer Bryson DeChambeau will not be allowed to go defend his national championship he won earlier this year. That is a pure shame, unless something can be worked out with the NCAA. However one thing that would have to be examined, is whether some of the illegal contacts that were made by the previous coach, included DeChambeau. Was his recruitment within NCAA guidelines, if not the entire golf ball of wax changes. For now it seems that when it comes to SMU there are more questions than answers. The other two names that are in the news are Tom Watson and Phil Mickelson, and on a day that the Ryder Cup was in the news, their names are not linked this time. Watson was first up on the tee when he was invited by current PGA President Derek Sprague to be in the PGA Hall of Fame, located in Port St. Lucie Florida. 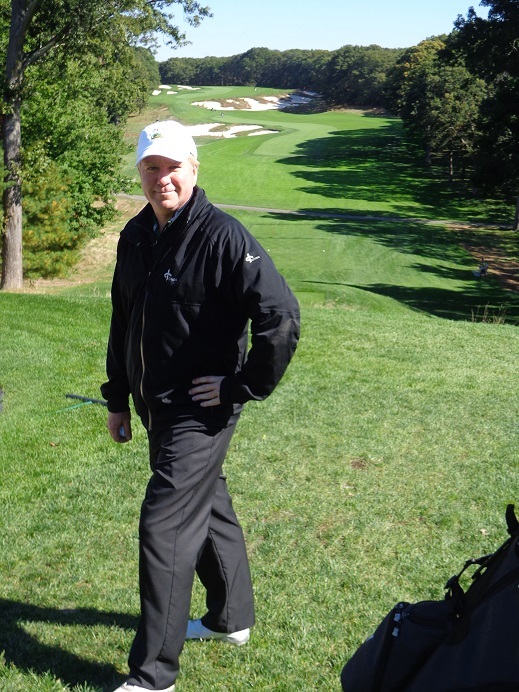 While Watson was flattered, he informed Sprague he would take a pass, because of the organizations treatment of his friend former PGA Presdient Ted Bishop who was pushed out of office with a month left in term, for something he posted on Twitter. The PGA of America might have to rethink about it’s quick reactions to various issues, between the Bishop situation and it’s response in pulling the Grand Slam of Golf away from a Donald Trump course in California, because of comments Trump has made in his campaign for president. Trying to appease the PC audience, isn’t always as PC or popular as some might think. PHIL MICKELSON who has had his say on Torrey Pines Golf Club in San Diego, and renovation work done on the South Course by architect Rees Jones, was part of a group that was bidding to do renovation work on the clubs North Course. Mickelson in effort to shape one course the way he would like it, and the way he feels most public and amateur golfers would like to see it, has pulled out of the bidding process to land the job. While it appears the group that would have been working with Mickelson will still have a bid, but Mickelson’s name will not be attached. Mickelson got fed up with the bid process and decided to walk away from the project all-together. Meanwhile the process to start renovation work on the North Course, will drag on, and on, and on. UP IN OREGON..the news wasn’t good either for a proposed new golf project that would involve Bandon Dunes Resort owner Mike Keiser, so stay clicked in that report coming up later right here on the Gog Blog. 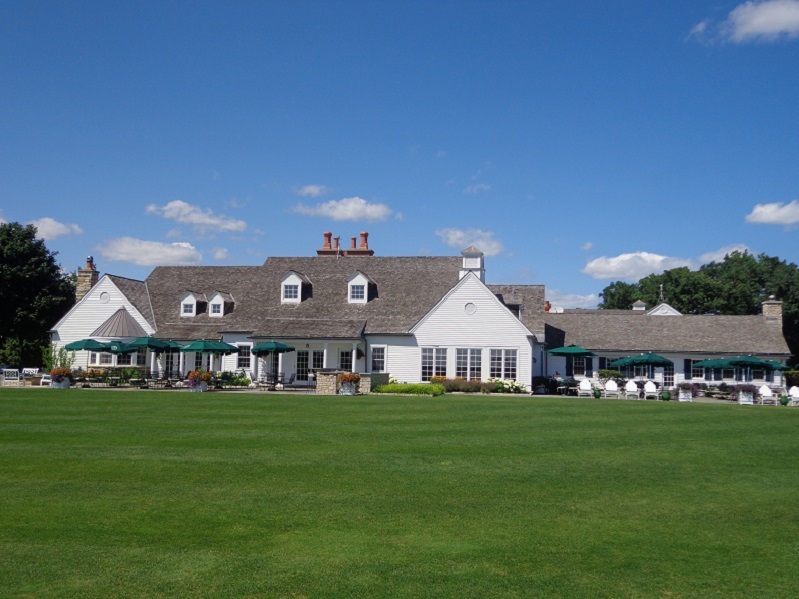 The 2016 UL International Crown, Chicago’s Premier golf event for 2016, July 19-24 at Rich Harvest Farms in Sugar Grove, see ULCrown.com for more details. You can sign up now to volunteer, some ticket options and corporate hospitality are also available. 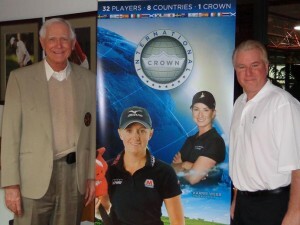 If you need to know what’s the UL International Crown, click here to hear LPGA promo. The Gog Blog by Rory Spears, Editor and Director of Content. Follow Rory on Facebook, Linkedin and Twitter @GogBlogGuy at Rich Harvest Farms, with the International Crown Trophy. If you were looking forward to enjoying the summer golf season, well I hope you did, because as of now it is over in spite of what the weather outside looks like at the moment. The weather we have had over the last few weeks, is some of the best we have had in recent months. Around the Chicago area some of the best time to enjoy golf is in the fall season, the temps have cooled off, the colors on the course are coming out and there is nothing like a good fall walk around places that are home to a great 18 holes on your scorecard. The courses are a little less crowded on some days and that makes for a better pace of play. I know I’ll being as much as possible in the next 6 weeks or so, until Mother Nature takes away golf season, and it becomes dome season. These past two days the Northwestern Wildcats have hosted their own invitational, the Windon Memorial. This year the winner was the Purdue University Boilermakers, who won their first tournament since 2011. It was the first time Purdue has won a tournament other than their own invitational, and outside of the state of Indiana since 2010. The margin of victory was 15 shots over the second place Michigan Wolverines. Northwestern who finished with a 54 hole score of 4 under par, ended up in third place, the tournaments was played at Lake Shore Country Club. CHICAGO IS HOSTING some national golf championships in the next few weeks, and just when you thought tournament season in town was over. First up is the first ever national championship in Footgolf, and it will be played at Waveland Golf Course on Lake Michigan in Chicago, not far from Wrigley Field this Saturday. The course is also known these days as Sidney Marovitz. The nine-hole course will host both a morning and afternoon session to decide the championship. Over 100 players will take part. Then don’t forget Mid-October at the Glen Club in Glenview, the Speed Golf National Championship is coming. These guys are fast, running up and down the holes, while carrying their own golf bag’s, no caddies here. Jordan Spieth on the right is the 2015 PGA Tour and Fed Ex Cup Champion. A tip of the cap or golf visor to Jordan Spieth who is the 2015 Fed Ex Cup and PGA Tour Championship. With the win, Spieth took Tiger Woods out of the record book (as so many players have done in recent years) by making the most on course money in one year, as any player on the tour has ever done. Some 23 million and change for those of you who are counting at home. With the win Spieth moves back into the No.1 position in the world golf rankings, sending Jason Day back into the No.2 spot, with Rory McIlroy still at No.3. Congrats Jordan, well played well deserved. THERE IS new equipment coming out on the market, Titleist, Callaway and Cleveland are among the companies, coming out with new product in time for the fall season. The Gog Blog needed a little break last week, so I was short on content, but that will change this week and next. I did miss doing the radio show yesterday for the first time in 24 weeks, but I did enjoy playing some golf and taking second place in the Shepherd’s Crook Players Club Scramble. 60 and a second place finish is not bad. Neither is the Chili Scramble Shepherd’s Crook is hosting on October 10th, sign up quickly time is running out. Call the course at (847)-872-2080. The Gog Blog by Rory Spears, Editor and Director of Content. Follow Rory on Facebook, Linkedin and Twitter @GogBlogGuy. At Bethpage State Park Black Course. It has been done before, and there is nothing better than creating a golf course at a unique location, that attracts golf tournaments from the major golf organizations. Sometimes courses are created by private ownership such as the work done by people like Mike Keiser, or from counties or cities. Whether it is places like Bandon Dunes in Oregon, or something like Chambers Bay near Seattle in Washington, that was created out of an old gravel pit by Pierce County. The best golf architects when they create new courses or renovate old ones, find ways to give the golfers options on holes. Perhaps what Chicago needs is more options in terms of courses, where golf organizations like the PGA Tour, the USGA and the PGA of America can take tournaments. What’s wrong with some of our top current venues, like Medinah, Olympia Fields, Conway Farms, Cog Hill or Kemper Lakes, well nothing. In fact most of these courses have done recent renovation work to improve their courses and clubs. But in the name of designing something new, Chicago might have to get creative to attract a new tournament or hang on to one that leaves town too often. Current NBC Golf announcer Mark Rolfing (on leave to fight a cancer issue, get well soon Mark) has come up with a plan that has gotten some conversation. The Chicago Tribune’s Teddy Greenstein reported Rolfing’s idea that includes the combination of two courses, South Shore and Jackson Park. It would take some build up on a corner of Lake Michigan to connect the two courses located about 7-8 miles south of Soldier Field. The area as it is now is mixed. Some law enforcement types don’t paint the best picture when you get about 1 block away from the courses. While others talk about a proposed President Obama library in the area near the course, and proposed development of the area. The interesting concept is that the new course could be by a body of water, Lake Michigan. But is budding up a body of water always the best thing. Well, water along the course looks nice for the TV cameras, it even looks nice for the cell phone or pocket camera’s the everyday golfer will carry. But in an even bigger picture, it does restrict where you can put corporate tents and sky boxes. At Chambers Bay the USGA could not get spectators everywhere they wanted them to be, tickets were cut off because of space. It makes getting in an out of the area during tournament week tough, kind of like getting in or out of Soldier Field from a Bears game or major event. It’s still a mess 2-3 hours after the event is over. Is there a good way to get to the area where the courses are at between 67th and 75th street, not really. Even with the Dan Ryan/Bishop Ford running past a great facility like Harborside International, getting in and out of there is not always easy. All of this brings me back to a piece I wrote for Chicagoland Golf in June. 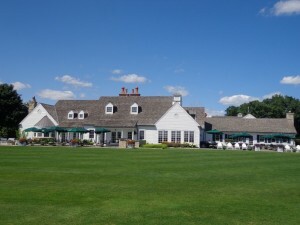 Wondering if the there was a way to improve Cook Counties George Dunne golf course, and create the atmosphere there, that was built at Bethpage State Park. I still think there is, but question remains, would the USGA or the PGA Tour get on board with such a project. Could someone entice the Ben Crenshaw’s and Bill Coore’s of the world, or a Gil Hanse to create something that would attract big events, and starting in 2020 keep the BMW Championship in town every year, or two years in a row and like 4 of 5 instead of 3 of 5. Multiple architects have told me they would love to do something in Chicago, but would they take a pay cut if necessary to be involved. What about Cook County, did they do well enough to impress the USGA during U.S. Amateur week at Olympia Fields. Any past concern about a bill for security from Cook County should now be washed over the dam and no longer be an issue. Rolfing and I might have the right idea, Chicago might need to create something new with new financial partners and new ways to get people the like Western Golf Association involved, with a new Evans Scholars House that could put caddies in Chicago’s colleges, including shipping them mostly out of the state of Illinois. BMW Championship week is a great week for the Western Golf Association and the Evan Scholars Foundation. The championship is also the biggest money raiser for the organization. Based on the great week at Conway Farms, with large amount of fans in attendance and Jordan Spieth’s Hole-in-one, the scholars had a great week. Why Spieth’s ace made such a difference is because anytime a player makes a hole-in-one championship week a lucky scholar wins a $100,000 college scholarship. Spieth is not the first play to do this, he joins Sean O’Hair, and Steve Stricker as other players who have made their shot count for the caddies. Later this year, BMW the WGA will select and award the Scholarship in Spieth’s name to a student caddie who attend college in fall of 2016. Speith made his hole-in-one in Round 1, on the par 3, second hole, his 11th of the day, his shot was 184 yards with a 7 iron. Wednesday Sept 16, 2015. @Charles Cherney Photography. 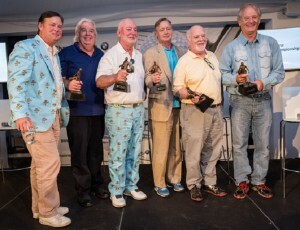 Murray brothers enter Caddie hall of Fame. 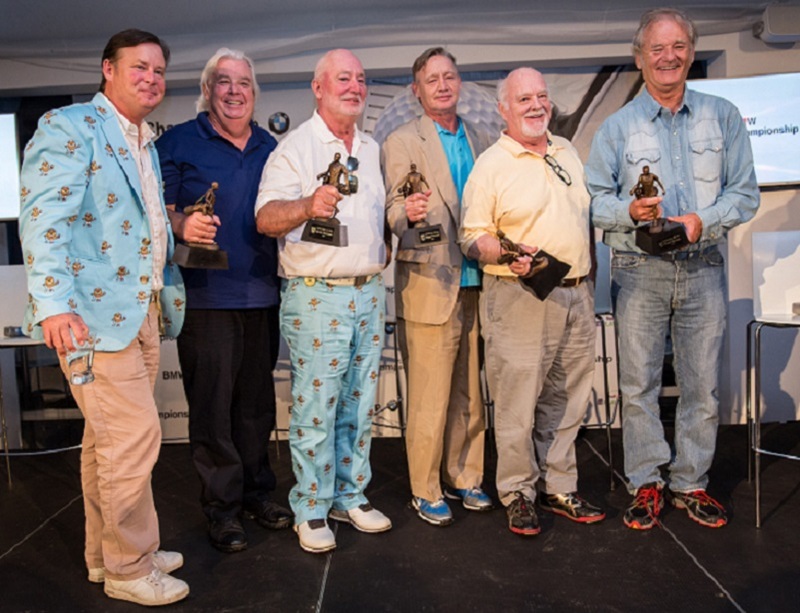 Actor Bill Murray and his five brothers who were caddies at the Indian Hill Club in Winnetka, that inspired the classic hit movie “Caddyshack” were inducted into The Caddie Hall of Fame during BMW Championship Week. The Caddie Hall of Fame has been run by the WGA since 2007, and recognizes those who have devoted their lives to the game through caddying, or by supporting those who have caddied. The Six brothers Bill, Andy, Brian, Ed, Joel, John, talked about their caddie days their family and golf during the ceremony. Murray’s portrayal of Bushwood Country Club’s groundskeeper Carl Spackler helped make Caddyshack one of the great movies of all time. The Evans Scholars Foundation is currently supporting 910 caddies, most of them attend one of the 14 schools that have Evans Scholars Houses on campus. 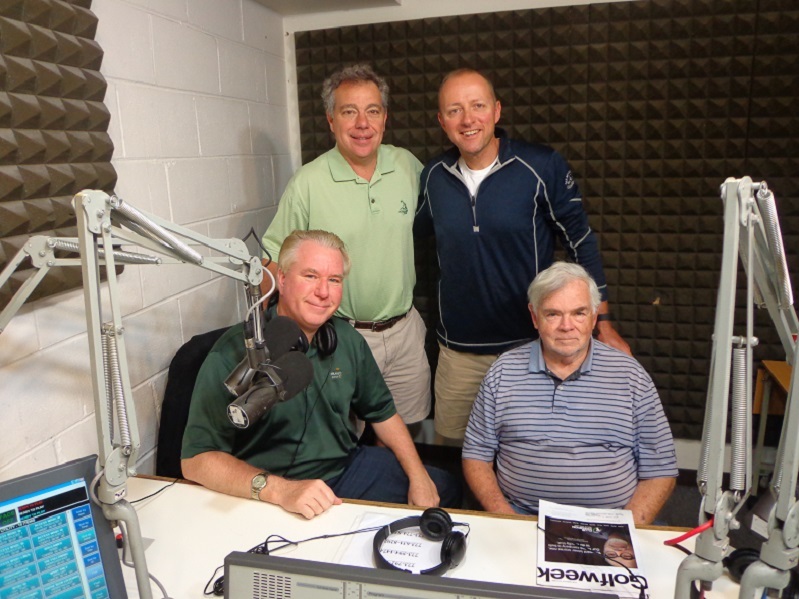 Golfers on Golf Radio Standing (L-R) Mike Munro & Ed Stevenson, Seated (L-R) Rory Spears and Bill Berger. (LEFT) In the Studio, (RIGHT) Fade to black for another year. 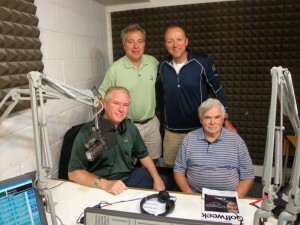 Golfers on Golf Radio ended it’s 20th season on the air yesterday, after conducting it’s 23rd show of the year. The longest 1 year run in shows history. Just 5 years ago, the show was only 15 weeks, now it goes for two months longer. Our final 60 Minutes of the 2015 golf season was a good one. Guests included Tim Rosaforte of NBC and the Golf Channel. Plus plenty of good golf talk about our favorite sport here in the Chicago area. If you missed the show, please visit this websites past shows area, and play it back. 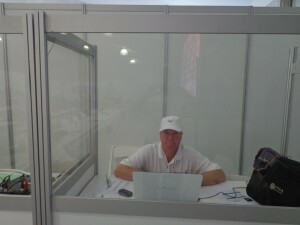 The Golf Season never ends here at Golfers on Golf Radio and Golfersongolf.com. There is reason this is Chicago’s No.1 Golf News website. 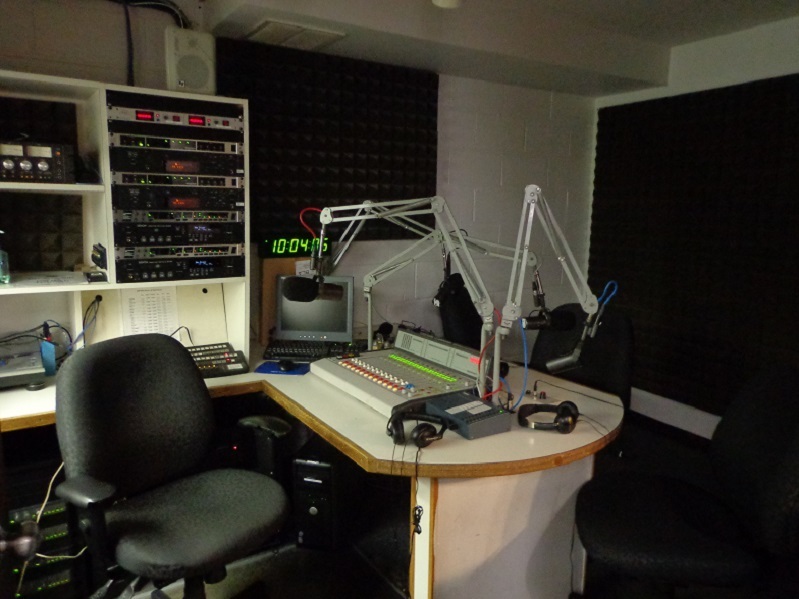 We hope you will stay with us all fall, winter and spring until the radio show returns in 2016. Our group will spend the winter working on even better shows and content for 2016. All fall and winter long, the golf news does not stop here. Renovation updates, equipment news, travel destinations, great holiday gifts for yourself or your favorite golfers. Hot news from the PGA merchandise Show in Orlando in January of 2016, the latest from Tinley Park and Rosemont when the golf shows come to town. What’s happening at the domes. Previews and news on the tournaments in 2016. Chicagoland Golf has it’s last issue of 2015, coming out next week, pick it up all fall, and check it out online at Chicagolandgolf.net. Our partner in print Chicagoland Golf published by Val Russel, still has one more issue coming out this tear, and it should be in your favorite pro shops and golf retail stores by next week. You can follow everything Chicagoland Golf by checking it out online at Chicagolandgolf.net with news coming all winter long. The first issue of Chicagoland Golf in 2016 will come out at the Chicago Golf Show in Rosemont late next February. The final issue will look back at the season we just had, and take a look at the 2016 golf season ahead. With a preview of the biggest golf tournament in town next year, the LPGA UL International Crown at Rich Harvest Farms, July 19-24, mark your calendars now. Jason Day at 22 Under Par, Won the BMW Championship at Conway Farms, he leads the Fed Ex Cup Point Standings heading into Atlanta and is the new #1 golfers in the World. I must say the exhibition put on by Jason Day this past week at Conway Farms was amazing, we saw some great golf by 69 other players, and on pro-am day by Bill Murray and his family, now all in the Caddie Hall of Fame, run by the Western Golf Association. 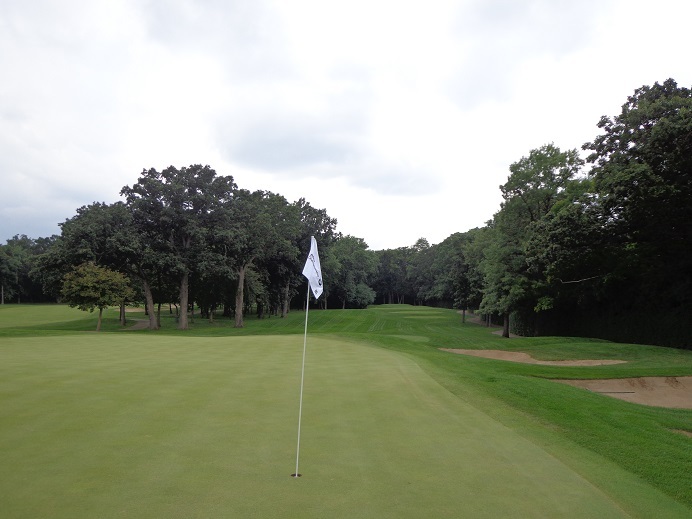 While all the excess rain was not needed, the crew at Conway Farms did a great job to keep the course playable and the weekend rounds running on time. Over four inches of rain fell in less than 48 hours, making for a mess around the course. It was amazing that some players thought there was no way another 59 could get posted on Wednesday, by Thursday we knew if it was going to happen again, it wouldn’t be Jim Furyk, who had to WD after 6 holes in Round 1 with a Left Wrist Injury. That left the task up to Jason Day, who ended with a 61 in Round 1, but Day had a 44 yard pitch for eagle on his last hole that would have made for a 59. He settled for par, and then went out and posted a 63 on Friday. Day’s 69 on Saturday left him feeling like he shot 80, but after another 69 on Sunday he had won the Championship and he was the new No. 1 in the world. The Gog Blog returns with more recap of the BMW Championship tomorrow, and takes a look ahead at the future sites. The Gog Blog by Rory Spears, Editor and Director of Content. Follow Rory on Facebook, Linkedin and Twitter @GogBlogGuy. Reporting from Conway Farms. Jason Day talks about his win at the BMW Championship at Conway Farms. Jason Day didn’t shoot another 61 on Sunday, but he didn’t have to. He didn’t need another 63 either, but his final round 69 was his fourth straight round in the 60’s and it was enough for him to win the BMW Championship and his second Fed Ex Cup event during the 2015 season. With his win, he remains in first place in the Fed Ex Cup Playoffs heading into the Tour Championship in Atlanta this week. In addition, Day met a goal he has had for a long time, and that is becoming the #1 player in the world, with the win he passed Rory McIlroy who drops down to #2 after a 4th place finish at the BMW. Day now thinks he has a chance to pass Jordan Spieth to be the 2015 Player of the Year, if he wins at Atlanta this week at the Tour Championship. If he wins the Tour Championship he will win the Fed Ex Cup. Bubba Watson mounted a great charge with a 29 on the front nine, Watson continued his move on the back nine with birdies on 12 and 14, but he gambled with a big tee shot on 15, and that led to a bogey. Watson made another bogey on 18 that left him in 10th place. Zach Johnson mounted a later charge as well shooting a 64, that included birdies on the last five holes, unfortunately for Johnson who won the BMW Championship in 2013 the last time it was played at Conway Farms it was to little too late. Rookie Daniel Berger finished second at 16 under par, and moved himself in the field of 30 in Atlanta. The last player to get into the field 30 man field in Atlanta was Harris English, who made a birdie putt on 18 to move into the top 30. Daniel Summerhays came in at 31 for the second straight year, after two years ago finishing in 32nd place. Phil Mickelson who had hoped to make a run into the Top 30, entered the week in 61st place, and ended up in 61st place after finishing in a T-32 position. 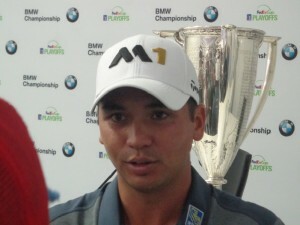 Click here to hear the press conference of winner Jason Day, and quotes from Rickie Fowler who finished 4th. To follow action online at the PGA Tour Championship this coming week in Atlanta, please visit PGATour.com. The Gog Blog by Rory Spears, Editor and Director of Content. Follow Rory on Facebook, Linkedin,and Twitter @GogBlogGuy. In the media tent at the BMW Championship at Conway Farms. The BMW Championship is a wet one, after 2.5 inches of rain fell in Lake Forest and on Conway Farms on Friday night and into Saturday morning. If you add that to the Thursday night rains of 1.5 inches, Conway Farms has taken 4 inches of water on 48 hours. That might be enough to close some courses with flood conditions, but the crew at CF, has done the job and kept the PGA Tour on time, with round three going off as scheduled. The TV networks especially and the fans are pleased. See BMWChampionship.com for more news on the tournament at Conway Farms in Lake Forest. JASON DAY is rolling towards being the #1 golfer in the world, he is only 18 holes away. Jason Day continues to be on roll and is looking like he will be the new #1 player in the world. Current #1 player Rory McIlroy shot himself into contention for a top 3 finish but still appears to be to far back to catch Day in the final round. Day has shot 61-63 and 69 in the first three rounds at Conway Farms, which is good enough for a 6 shot lead over Scott Piercy and Daniel Berger. Day leads McIlroy who is in fourth place by 7 shots and Rickie Fowler by 8 shots. Day admitted Round 3 is one he was glad to get behind him, saying that shooting 69 after his 61 and 63 of the last two days, felt like shooting 80. But he likes his six shot lead and looks forward to the challenge of winning on Sunday. For more online information about the BMW Championship and the Fed Ex Cup Palyoffs, visit Pgatour.com. For additional information on the Western Golf Association and the Evans Scholars Foundation, see WGAESF.com. For a great fall season golf trip, go to the home of American Golf, Pinehurst in North Carolina. See Pinehurst.com for more details. McIlroy knows there is a lot of work to be done if anyone is going to catch Day, and says Day will have to come back to the field a little bit, if anyone is to catch him. Rickie Fowler said it kind of feels like the battle is for second place, he might be right. Click here to hear press conferences of in order, Jason Day, Rory McIlroy and Rickie Fowler. The final round of the BMW Championship will start about 7:15 an with the leaders going off about 12:45. Come out and see the final round of the championship at Conway Farms in Lake Forest. Golfers on Golf Radio will have a full recap of the tournament starting at 9 AM on WSBC AM 1240 and WCFJ AM 1470, the final show of the season. AT Conway Farms in Lake Forest, Round 3 of the PGA Tours Fed Ex Cup Playoffs in 2015. The Gog Blog by Rory Spears, Editor and Director of Content. Follow Rory on Facebook, Linkedin and Twitter @GogBlogGuy. 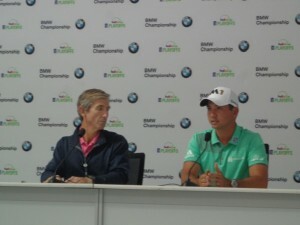 For more online information about the BMW Championship and the PGA Tour, visit PGATour.com. No, Jason Day did not shoot 59 in the first round of the BMW Championship, his chance to do so came up short early on Friday morning, when his wedge shot from 44 yards, did not find the center of the cup. Neither did his birdie putt, so Day settled for Par, a 61, and a three shot lead after day 1 or day 1 and half. Day’s playing partner Jordan Spieth teased Day by saying,” only a par with a 59 on the line, you would have expected better from a preferred lie.” Lift clean and place are in place as the rule of the day, with Conway Farms getting 1.5 inches of rain late Thursday and overnight into Friday. 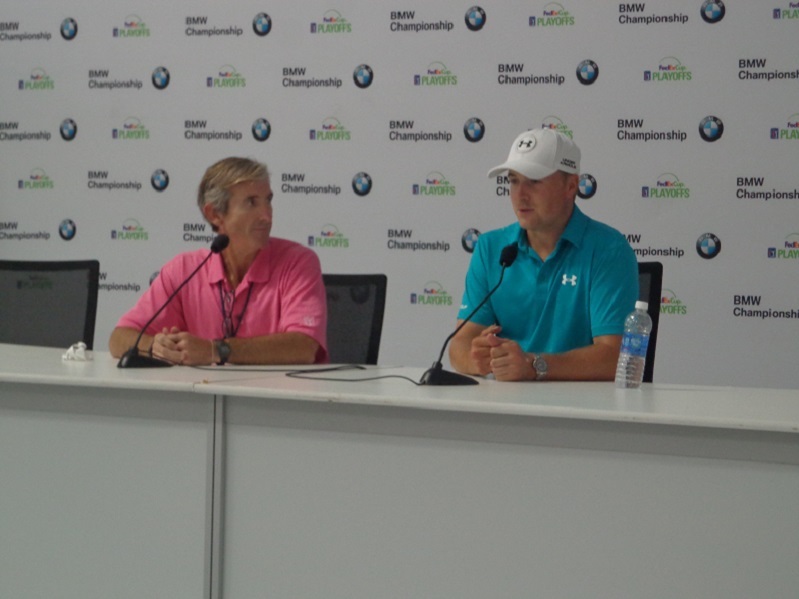 Spieth also joked that making a hole-in-one was the only way he could win a hole from Day. The two are paired together again in Round 2 with Rickie Fowler. The real credit for a great Round 2, goes to the crew and volunteers who worked all night and into the early hours of the morning to have the course ready to go for the players. They all did an outstanding job. Round 2 got rolling right at 9 AM, and players went right back to making birdies and in some cases eagles. No there was not a Hole-in-One in round 2, but the large gallery that came out had plenty of reasons to cheer. Day lead the way again, backing up his first round 61, with an 8 under par 63 that left him at 18 under par. If this keeps up, the all-time PGA Tour record of being under par could fall this Sunday. With a win this week, Day will be come the new #1 Player in the World, another one of his career goals, says Day who ended his day by rolling in a long eagle putt on the 18th green. That was right after Spieth holed an Eagle from 77 yards yards out with a lob wedge. Brendon Todd (63) and rookie Daniel Berger (64) sit between Day and Spieth on the leaderboard, but they are five shots back and Spieth is seven. Rory McIlroy is is T-9th with Dustin Johnson, after McIlroy shot 65. Click here to hear Jason Day and Jordan Spieth’s press conferences. Round 3 tee times start at 10 AM off both tee’s. But from 6:30 PM on Friday night until past 7 PM, the rain has come down in buckets. The round could start late, stay clicked in for details, or visit BMWChampionship.com. The Gog Blog by Rory Spears. Editor and Director of Content. Follow Rory on Facebook, Linkedin and Twitter @GogBlogGuy. In the booth at Conway Farms-BMW Championship. ROUND 1 is in the books at Conway Farms and the BMW Championship is rolling and so is Jason Day who posted a 10 under par 61 to lead by 3 shots. Day who has won four tournaments this year, saw his stellar round of golf get stopped in it’s tracks with a weather delay while he was playing the ninth hole, his last of the day. Shortly into the delay, play was stopped for the day. Jordan Spieth who is paired with Day hit the shot of the day on his 11th hole, the normal 2nd hole, when he holed a 7-Iron from 196 yards, for a hole in one. Day actually had an eagle of his own one hole earlier, his 10th hole, when holed a bunker shot from the fairway for an eagle 2. The Par 3, 2nd hole at Conway Farms. Where Jordan Spieth made his hole-in-one. Daniel Berger was the early leader in the clubhouse with a 6 under par 65, he finished before the rain delay being a part of the first group out off the 10th tee. Jim Furyk the 2013 runner-up at Conway Farms and who carded a 59 in round two, won’t even be around to see round 2 this year. Furyk who was 1 over par after 6 holes, suddenly walked over to Dustin and Zach Johnson his playing partners and withdrew. Furyk cited an injury to his left wrist as the reason for his withdrawal, and is worried about being able to play in next weeks Tour Championship at East Lake in Atlanta. Australian Jason Day continues to be on a roll, and could shoot 59 for round 1 of the BMW Championship. Only 18 players including Furyk had their first round complete when the rains came. The first round will resume at 7:30 AM on Friday, with round 2 starting in the 9 Am hour. That is earlier than planned, which means the expected late Friday afternoon storms,might provide a problem in round 2. The weekend is expected to be a little cooler, but without rain. Some other players of note. Zach Johnson had a 3 under par 68, Dustin Johnson had even par 71. Matt Kuchar shot 67 -4. Still on the course Bubba Watson -4, Phil Mickelson and World #1 Rory McIlroy are -3. Click here to hear Jason Day and Jordan Spieth on Round 1 of the BMW Championship. The Gog Blog Returns tomorrow for the end of Round 1 and Round 2 Coverage.